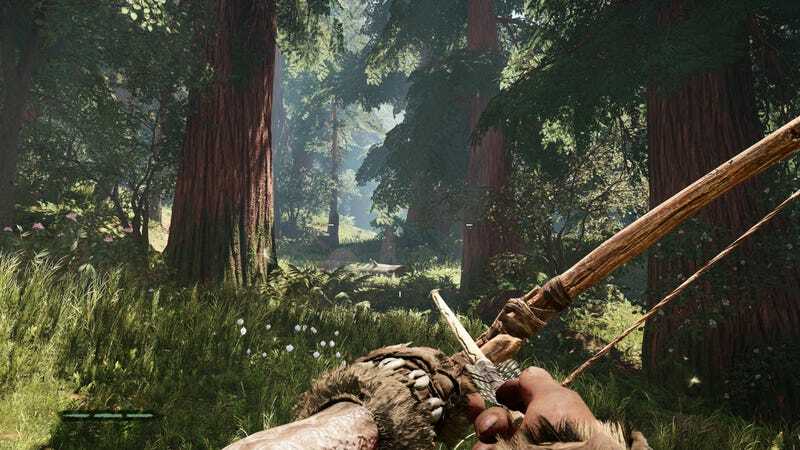 Far Cry Primal is a game about a caveman who explores a new land. If you play on the game’s default settings, it’s also about a caveman who methodically conquers that new land thanks to his helpful smartphone GPS. I started playing Primal on PC last night, and so far I’m feelin it. (“I’m feelin it” - Kotaku.com.) I’ve seen Stephen and others talk about the overfamiliar Far Cry formula, and how despite the prehistoric top layer, Primal is as much a Far Cry game as the last two. I haven’t felt that way yet, and I think it’s to do with the way I’ve been playing. Here’s how I’ve been approaching things. The most important change I can suggest is to turn off the minimap from the very start. (This won’t surprise longtime Kotaku readers.) I’ve yet to turn the minimap on and barely even know what it looks like; my screen has thus far been empty of the cursed little navigational circle. 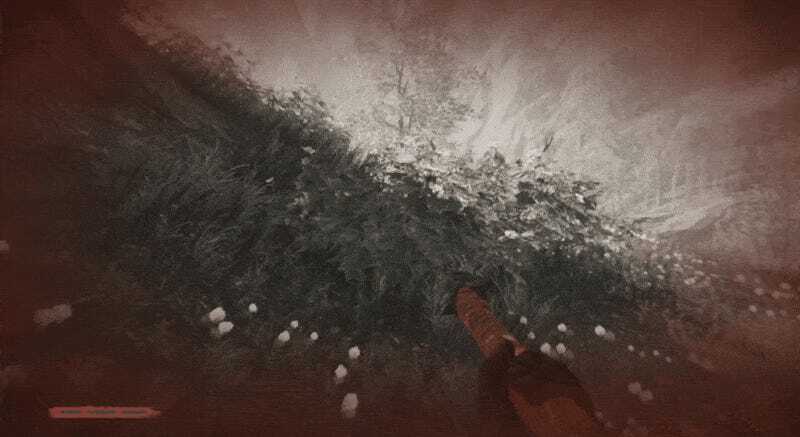 So far, Primal has made it easier than any past Far Cry game to play without a minimap. 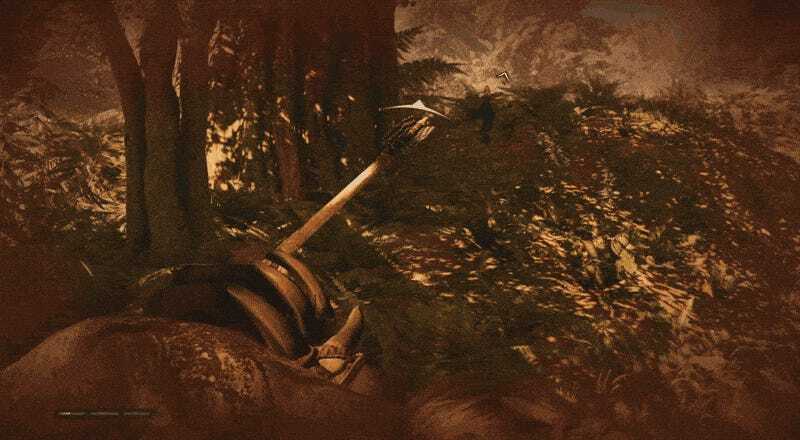 The protagonist Takkar’s hunting sense (aka eagle vision/detective mode) lets you spot crafting resources and downed animal carcasses easily, for example. Objectives and events appear on the HUD when you’re close to them, so there’s no need to track them on a map. Without a minimap, the game’s flow is significantly changed. I spent the first two hours simply wandering around, seeing what I could find, and hunting what I could. I’d do sidequests as I stumbled across them, but have yet to really seek them out. I figured out that a distant mountain was directly to the north, and have been using it to orient myself. I track enemies with my ears; I hunt with my senses. I’d heard that Primal’s default difficulty quickly becomes too easy, so I decided I’d start on hard difficulty this time around. It’s worked great so far: if I run into more than a couple enemies I have to play very defensively and be ready to run for my life. Any time I’ve run into a deadlier predator it’s been game over. And that’s how it should be, you know? I’m sure I’ll unlock abilities that help me take on the most dangerous enemies in the game, but for now, at the start, I’m fine with things being hard. As in past Far Cry games, Primal hero Takkar can craft all sorts of quick-heal items that he can munch down in the middle of a battle. I’m making a soft rule that I can’t use those. “Medicine” in these sorts of games becomes a crutch too quickly, essentially resetting a battle multiple times and letting me win with careless strategies that should have gotten me killed. Instead, I’ve limited Takkar to the patented Far Cry Grisly Heal™, where he pops a finger into joint or pulls an arrow out of his forearm in order to recover a block of health. I can still heal mid-fight, but it takes long enough that I have to be smart about it. It’s made the game harder, but in an interesting way, and has led to some exciting, protracted battles. Sometimes the game will tell me I’ve unlocked a fast-travel waypoint. “I don’t care!” I try to tell the game. I’m playing with no fast-travel, and am walking (or, soon enough, riding) everywhere I need to go. Something to at least try, if not something to stick with. Primal’s cavemen and -women speak a made-up language, so the entire story is subtitled. That fact alone has already pushed the narrative to the margins—it’s much easier to ignore subtitles than it was to ignore, say, Vaas—and I’ve been experimenting with pushing it even further by removing subtitles entirely. With no subtitles, I’m left to infer what’s going on in a given cutscene. So far it actually hasn’t been that hard: The shaman likes me, this one lady seems cool, and I can command animals. There are good guys and bad guys, and I’m supposed to kill the bad guys. If I really need to know my next objective I can just check the map, but so far I’ve found that removing subtitles gives the story an abstracted quality that I like. I asked Stephen if I’d be able to keep this up for the whole game, and he said it was unlikely, and that I’d be missing some cool story beats. I’ll probably turn them on at some point. For now, it’s certainly changed things up. I’ve played Far Cry, man. I’ve chased the icons across the map. I’ve cleared all the outposts. I’ve collected all the stuff. I’ve crafted all the things. I’m a little tired of that, so this time around I’m treating the game more as a structureless sandbox that I’m free to explore however I want. Primal barely has a story so far— even with subtitles—and I’m fine with that. I actually hope the story never really develops past “get new animal powers, defeat the other dudes, recruit more people into your town,” or gets so complex that I feel like I actually need to pay attention to what’s happening. I’ve let go of the standard sort of progression one usually makes in games like this. I basically just wander around. With no minimap, I have few things commanding my attention as I explore. I’ve barely been checking the world map for things to do, and mostly have just been taking challenges as I come upon them. It’s already led to a bunch of cool moments, in particular some breathless ambushes and near-death hunting showdowns. But it’s all just sort of happened, as I’ve learned my way around the opening area. Thanks to this approach, Far Cry Primal has yet to transform into that familiar Ubisofty spreadsheet of tasks to complete. Most of the time I feel like a caveman carefully exploring a new frontier, rather than a guy inching his way through the latest big-budget sandbox game. I’ve been having a great time, and the longer I can keep things wild and unstructured, the better.